MMAR Medical: Do My Children Need Orthotics? 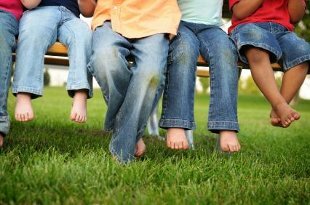 It is important to pay attention to the development of your children’s feet as the first few years of walking will impact how their feet develop for the rest of their lives. Long term flat footedness that is left untreated can lead to back pain, leg pain and several other conditions. Flat feet usually occur when the longitudinal arch fails to develop entirely, resulting in a collapsed arch which leaves the entire sole of the foot coming into contact with the ground. For some people this only occurs in one foot (unilaterally) but for others, it occurs in both (bilaterally). In infants, flat feet are common and to be expected – this is due in part to “baby fat,” which masks the developing arch and need not cause worry in parents. The development of the arch occurs over the course of a child’s infancy and early years. To aid your child’s arch structure development allow them to walk barefoot on varying terrain and exercise often. Doctors typically prescribe orthotic aids to children with flat footedness starting from a very young age. Conditions of flat footedness and other problems are noticeable from the age a child begins to walk so specially designed shoes and insoles can be implemented early on to prevent worsening of the problem. Usually around 4 or 6 years of age the arch should be fully developed. Symptoms and identifying factors of flat footedness become very apparent around this time and parents will bring in their children for evaluation if they notice distinct problems with mobility or if the child complains of pains. Children who complain about calf muscle pains or any other pains around the foot area or knee may be developing or have flat feet. For younger children, or those with less severe conditions, simply allowing them the opportunity to develop arches – with foot gymnastic exercises, barefoot walking or walking on moldable terrain like sand can help develop their arches. As with any medical condition, seeing a specialist such as a podiatrist will allow for a better diagnosis of your child’s situation. For many children with less severe arch impediments, support braces and orthotic insoles can help alleviate the problem. In other, more severe, circumstances custom-fit ankle or foot braces can be crafted for your child to wear. Sometimes they only need use an orthotic brace for a period of time before the problem is fixed. In some cases of persistent pain and flat footedness physical therapy and/or surgery may be the only options available. Consulting a doctor will provide you with the information you need to keep your children’s feet healthy! About the Author: MMAR Medical Group Inc. is a wholesale medical supplier specializing in diabetic footwear, orthotic inserts and various support braces. Please visit www.mmarmedical.com for more information.